3PO and R2 find themselves in the desert wastes of desolate Tatooine, in this final page of Pt.1: And things get a bit mixed-up in today’s instalment. The blowing up « escape-pod and crash-landing on Tatooine scenes are a bit mixed up but you can consider it a preview of Pt. 2 which is coming to you next. You know, it’s a measure of my dedication to you – my public – that I’m writing today’s issue on my Holiday in Baltimore, County cork [It was 2010 – John] despite the effects of a few glasses of vino, at a quarter to midnight. But “No! – you say. Surely it’s a measure of how UN-dedicated you are – drinking even though you have a duty to fulfil.” Well, it’s all a matter of perspective. Oh dear. A bit extreme. Well, Warlord Comic would seem to have been quite an important influence on this one – more’s the pity! 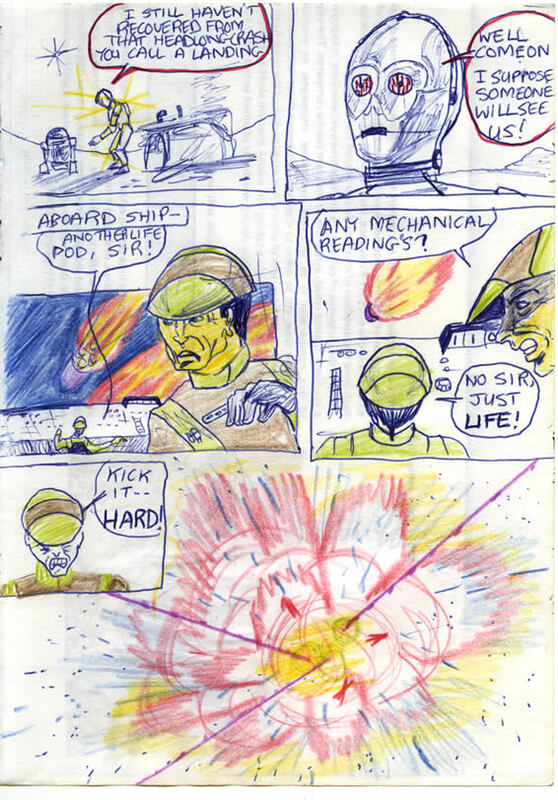 In a corny page to end all corny comic pages we get a totalNazi-style Imperial officer; and yes, THE worst most corny line ever “Kick it hard”. Can you tell how much I was enjoying feeling just how twistedly evil that character was – in every fibre of my being – when I drew that small inset panel, with its totally cartoony contorted face? 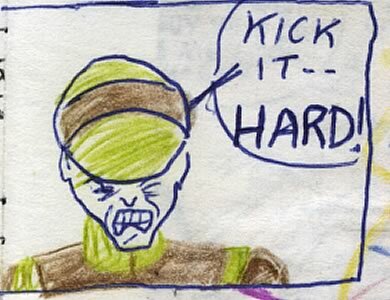 “Kick it hard…” Oh, the embarrassment. And now, here it is. Before billions. On the world wide web. 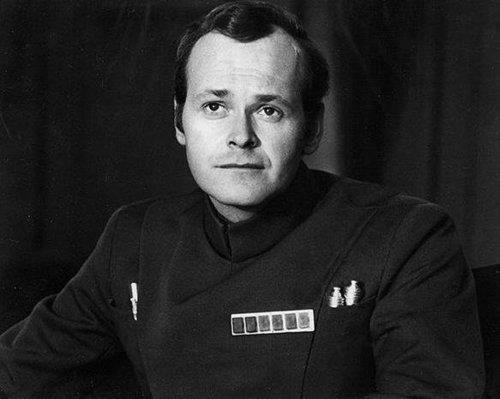 Poor Richard LeParmentier – aka – Admiral Motti passed away yesterday on the 16th. He was, by all of the accounts that I’ve read, a good bloke and a fan-favourite on the conventions circuit; which he seems to have enjoyed immensely. Always willing to act out his famous Death Star Conference Room choking scene. He was the first character to have been force-choked by Vader. The previous victim was only given a regular choking by Vader, aboard the Tantive IV. Perhaps he was the first unfortunate that Darth had tried it on? What a rare honour! It was good scene in Star Wars and he played it wonderfully. As did his throat. I’d say it was right up there with Noomi Rapace‘s belly-acting in PROMETHEUS. I was disappointed not to have gone to a Star Wars convention that he guested at, called INVASION in Northern Ireland a couple of years ago. I would have liked to have met him. And I have to admit that it would have been nice to have got his signature onto this comic. I’m also sad to say that the number of Original ’77 Star Wars actors is dwindling rapidly. Rest in Peace Richard. You will be missed by friends, family – and a legion of fans. hiya sam, sorry nothing new’s been going up. on holidays but returning home now in the car as i type this. there should be new page on monday! i’m giving updates on facebook and twitter. i should rss them too.